Niro has been steadily carving out his brand of house music over the past few years with releases for Kimochi Sound and his own Unclear imprint, which was birthed out of the Klang Club where he hosts events and recently launched his very own Lobster Theremin distributed PADS imprint. This time round though he joins the roster of New Yorker Fred P aka Black Jazz Consortium’s Board imprint with yet more material. Up first on the package is ‘Fill The Colors With Soen’, setting the tone with dusty drum sounds, stuttering acidic bass stabs and expansive atmospherics whilst jazzy synth lines ebb and flow throughout the groove. 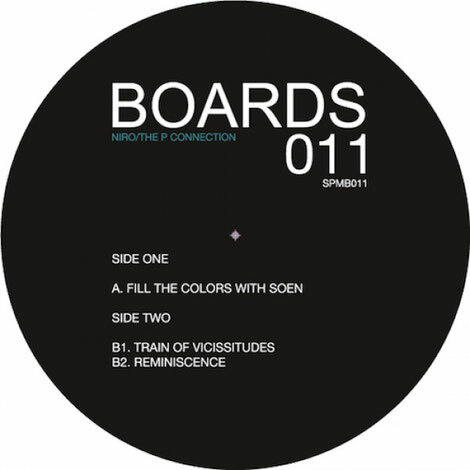 ‘Train Of Vicissitudes’ follows and tips the focus over to a more groove-led feel with fluttering Rhodes style chords, shuffled rhythms and spiralling synth melodies before ‘Reminiscence’ closed the package on an off-kilter electronica tip with a glitched out drum machine taking the lead alongside intricate arpeggios, haunting pads and menacing bass drones. It’s out on Boards today.